Click on the book cover to check out the buzz on Goodreads! 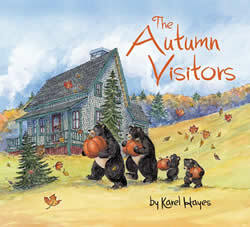 In this fifth book in Karel Hayes’s acclaimed Visitor series, the family of bears awakens in the cottage after a nice winter sleep. But torrential rains and a little too much fun hamper their efforts to leave the cottage shipshape for the returning human owners. Will they be able to avoid detection once again? 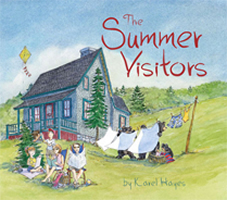 Honorable Mention in Best Children’s/YA Books category from the Maine Writers and Publishers Association. 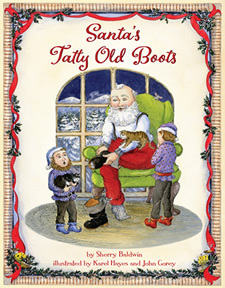 Santa’s getting dressed for Christmas Eve, when he discovers his boots are worn out! 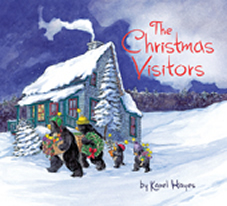 Mrs. Claus, the elves, and the reindeer all want to help, but how will Santa keep warm on a snowy night wearing his tatty old boots? This richly illustrated, holiday tale celebrates sustainability, and reusing rather than buying, as it shares the funny ways Santa tries to find some warm footwear. 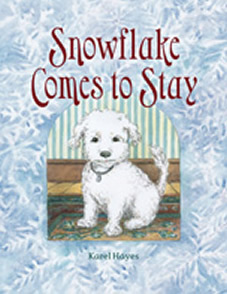 Artists Karel Hayes and John Gorey bring Santa to life as he’s never been seen before, wearing flip-flops and bowling shoes, in a Christmas tale from author Sherry Baldwin that’s sure to keep your toes warm. “Santa must have a new pair of boots…. Or is there a better solution? 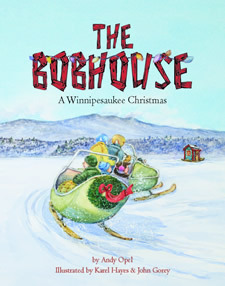 Baldwin’s rollicking, rhyming Christmas Eve tale addresses the throw-away nature of modern culture so subtly that little ones won’t realize it’s anything other than fun. Illustrated with beautiful watercolors reminiscent of vintage Christmas cards . . .” —Barbara Jean Hicks, author of FROZEN: A SISTER MORE LIKE ME and ONCE UPON A PARSNIP. 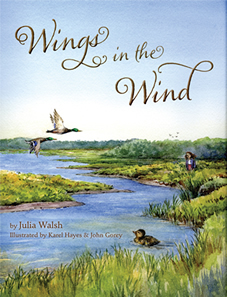 This is a story of one courageous Mallard who lost his family but did not give up, and about a little girl who watched and loved the duckling as he struggled to make it to adulthood. 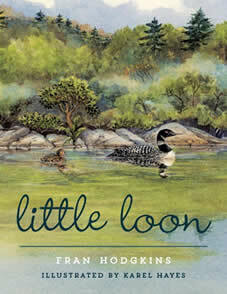 It takes place on the Merrimack River in Massachusetts and is based on a true account of one duckling’s survival. 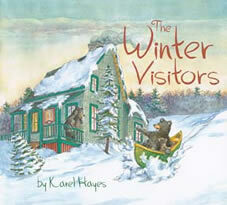 Themes of home, family, friendship, and nature are presented, as it explores the dilemma of safety versus growth. 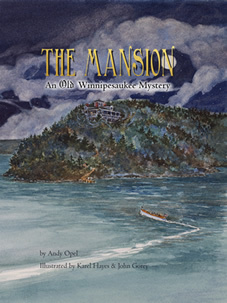 From the award-winning author/illustrator team who created The Witches and The Weirs comes the latest Winnipesaukee adventure - and this time it's a mystery! Join Jack, Franny and J.J. as they learn about how the lake used to be and Grammy tells them a spooky story about when she was a little girl. Read the New York Times Sunday Book Review. 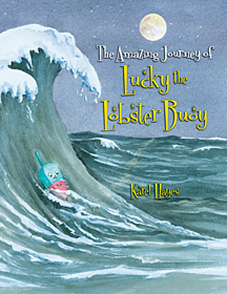 Karel read an article about a lobster buoy that was lost and washed ashore in England while on a sailing trip. 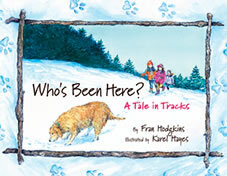 She knew there was a story- a very fun story for children! Tim carves his first lobster buoy out of wood. The buoy looks like a face, so Tim paints it eyes and a mouth and names the buoy, Lucky. One day, Lucky is set adrift in the ocean and after fun and amazing adventures, Lucky returns to Tim. Lake Winnipesaukee is a vacation destination where families gather to rekindle bonds across the generations. 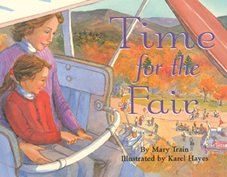 Join Jack, Franny and J.J. as they go on a boating adventure with Grammy. 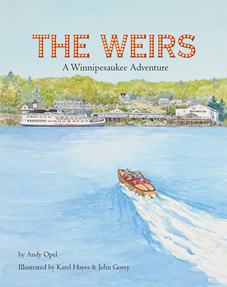 The timeless magic of boating at night is captured in this classic trip to the Weirs. 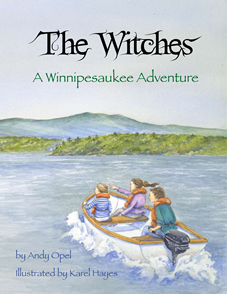 In a classic tale of kids “messing about in boats,” The Witches captures the timeless magic and mystery of Lake Winnipesaukee in New Hampshire. Join Jack, Franny and J.J. as they learn about the power of the lake and the wisdom of their grandmother. 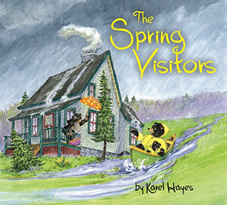 The Witches was awarded the 2011 Best Children’s Book Award by the New England Book Festival.